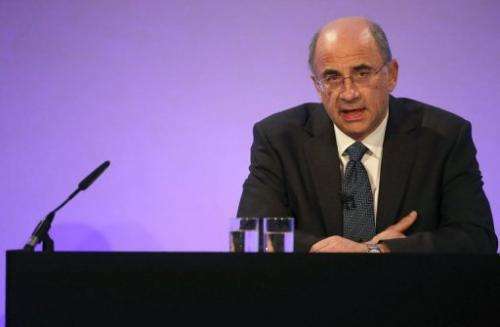 This file photo shows Lord Justice Brian Leveson delivering his findings into the 'Leveson Report', in London, on November 29, 2012. Leveson on Wednesday warned that bloggers and tweeters should be subject to the same laws as traditional media outlets to prevent a decline in standards of journalism. The man who led the inquiry into Britain's phone-hacking scandal has warned that bloggers and tweeters should be subject to the same laws as traditional media outlets to prevent a decline in standards of journalism. Senior judge Brian Leveson said court judgments and civil rulings such as name suppressions must be enforced for Internet users just as they do for major newspapers, magazines and journals. Otherwise there was a risk that the standard of journalism would drop as press companies try to compete with new forms of digital media, Lord Justice Leveson said in a speech at Melbourne University Wednesday evening. "If we are to ensure that appropriate standards are maintained, we must meet those challenges and ensure that the media not only remains subject to the law but it is not placed at a disadvantage where the enforcement of the law is concerned," he said. "We will therefore have to think creatively about how we ensure that the law is capable of equal application and is applied equally and fairly against the mainstream media and bloggers, tweeters and other online amateur journalists." Leveson, who led an eight-month inquiry into the culture of British media sparked by the phone-hacking scandal at Rupert Murdoch's News of the World, said if change did not happen journalists could be tempted to cut corners. "In order to steal a march on blogs and tweeters, they might be tempted to cut corners, to break or at least bend the law to obtain information for stories or to infringe privacy improperly to the same end," he said. "In a culture which sees some act with impunity in the face of the civil law and the criminal law, a general decline in standards may arise," he added in his speech on the challenges facing mainstream media in the digital age. In his report on the British media, Leveson said the newspaper industry had for decades "wreaked havoc with the lives of innocent people" and ignored the codes that it had itself set up. The judge recommended an independent press regulator, underpinned by legislation. Leveson declined to comment on the prank call by Australian broadcasters to a London hospital treating Prince William's pregnant wife Catherine, after which a nurse who fielded the call apparently committed suicide. "As I understand it, the police in London are investigating this and there is an inquest ongoing and I still remain a judge in England and Wales and might be called upon to decide something in the future," he said. "So I'm sure there are lessons to be learned but I'm not going to discuss them."